The G6 Nintendo DS development is what I would call the first proper solution as it has the highest compatibility rate and features full SRAM management . Due to the fact that I was involved in the beta testing of the G6's software (including its BIOS) you should be presented with a unique view of this product along with information you will most likely not be able to obtain anywhere else. Using the G6 one will be able to boot legitimate homebrew/backups for both the Nintendo DS and Game Boy Advanced handheld video game systems. 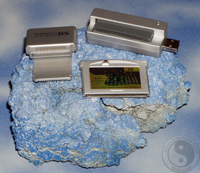 The G6 comes with an USB interface for direct interaction with your Windows based computer and features the ability to backup your SRAM, boot images of any size and no need for special carts for each type of image you'd like to boot. Golden Sun Team images (GST) were originally created to only boot using a competitors brand of development unit, but due to the G6 team implementing this format any GST users wishing to upgrade to a better solution will not be left in the dark. The G6 supports GST images ranging from 64Mb to 256Mb and will allow you to save using the NDS Save or GBA Save methods. G6 has created their own proprietary format which includes the ability to use an image of any size (no restrictions), direct boot them without having to wait for loading times and features a quick fix for FlashMe users. 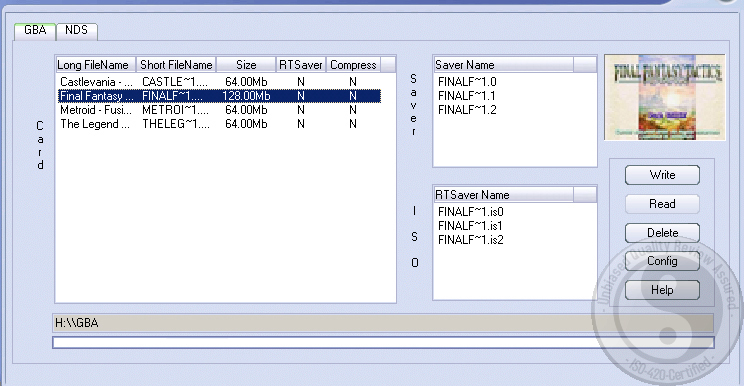 Whenever you load a CLEAN image using the U-Disk loader it is automatically converted to the DoFAT format. Before doing anything else I checked the G6's BIOS version by turning it on, pressed START to go into GBA mode and then selected the ABOUT icon which gave me the current version. Next I checked G6's webpage and it had a newer version online so I grabbed up the newer one. 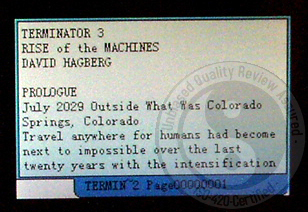 I then checked the U-Disk software version and downloaded it as the copy that came on the Software Disc was older. 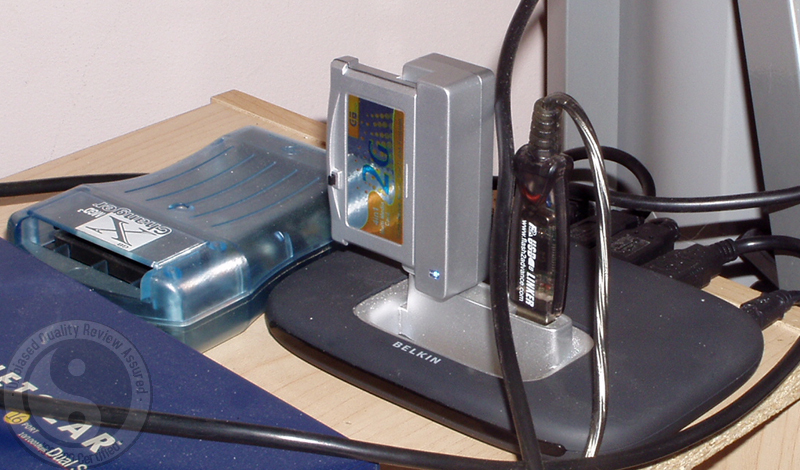 Next I plugged the FlashCart into the USB adapter and connected it to an empty USB port on my Windows PC. Next Windows automatically installed the device as Mass Storage Device and named it " USB NAND Flash Disk USB Device ". After this was completed I could access the G6 as I would any normal hard drive. Using Windows Explorer I copied over the latest BIOS files into the root directory and disconnected the G6, plugged it into the NDS and powered it on. Note that if you're BIOS is the same version that it will still help to read what I had to do below to upgrade the BIOS for future reference. Once the Nintendo DS was powered on press I pressed START to enter into GBA mode and then during the green warning text press START + SELECT + A + B and was prompted to continue the upgrade or to cancel. So I continued and the BIOS began to flash. If for some reason your Nintendo DS is powered off during the flashing process you will ruin your G6 so make sure to do this with a fully charged battery while plugged into the way outlet. Luckily I did not lose power and simply rebooted the NDS when I was finished, checked the current BIOS version and then went to get the rest of the installation process done with. 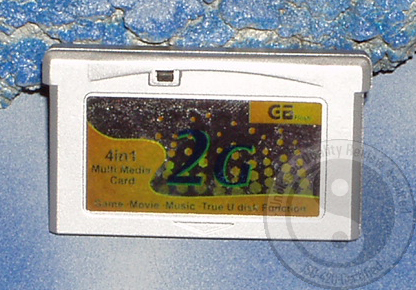 The Software Disc came with the G6 U-Disk Manager which manages both NDS/GBA games and their SRAM. When adding or removing NDS/GBA images I had to use this software as if you copy them directly onto the G6 the BIOS will get confused when you try to boot them. 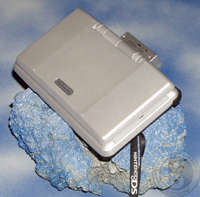 The Disc also contains the Media Conversion software along with the original file structure of the G6 flashcart in case you accidentally delete it. I would suggest installing both the flashing software, media software and then making a backup of the disc itself in case you lose it. 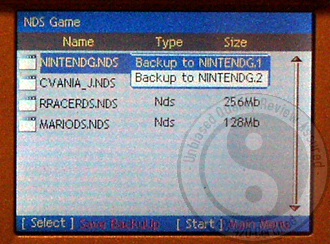 The U-Disk manager starts in Chinese mode, but can easily be changed to English with the language drop down menu. 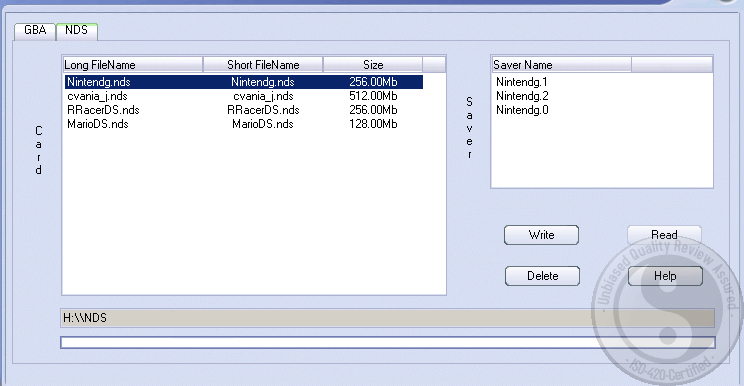 The program is pretty much straight forward giving you a GBA and NDS tab where you can add, remove images and/or their SRAM data to and from your PC. 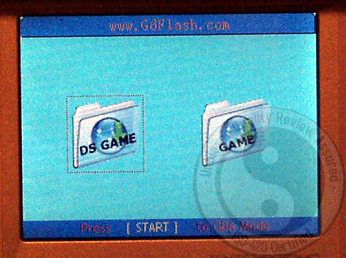 When booting up the Nintendo DS using the PassKey/FlashMe I was presented with a menu which gave three options: NDS Game, Game or GBA mode. 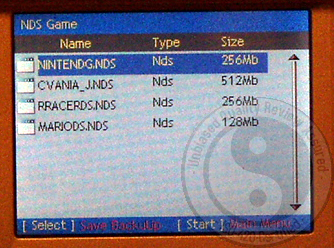 The first thing I tested out was Game mode which brought me directly to the NDS folder on the G6. The browser is controllable using the stylus (or in my case some chopsticks). 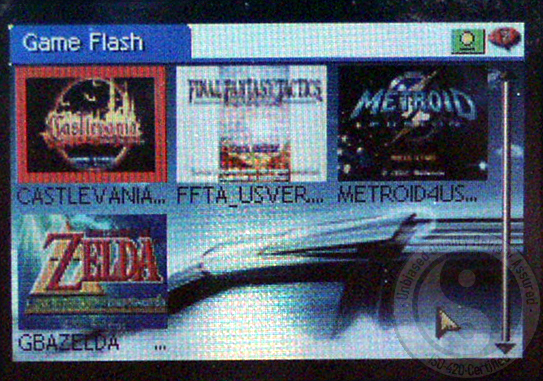 If you're going to run Demos, Emulators or Homebrew you must select the Game icon as all of these images need to be patched with a small header file before they will boot off of the G6 and by picking Game mode the G6 will automatically patch them in memory for you leaving the original file intact. The first thing I booted was a GST image. 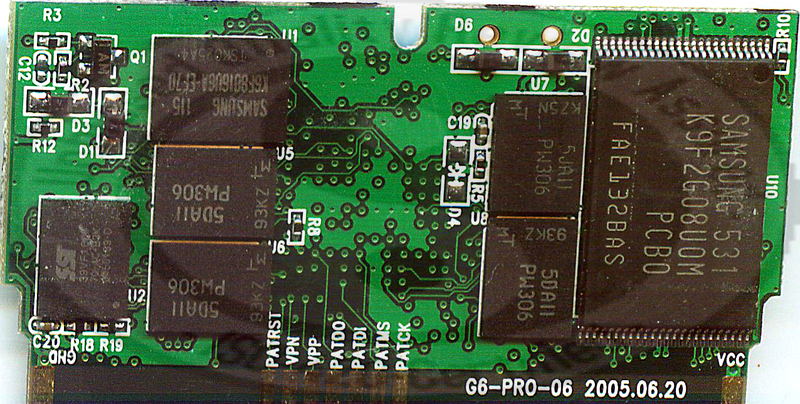 Before it loaded the G6 asked me where to load the SRAM from which was either in the MAIN, BACKUP 1 or BACKUP 2 SLOT. I picked MAIN (which of course was blank) and then waited a little bit for the image to load. Everything worked fine. I made my way to a save point and then restarted the Nintendo DS. Once entering the Game mode I pressed 'select' to load the SRAM manager and copied the main SRAM slot to a BACKUP SLOT. Next I removed the PassKey and restarted the NDS using only FlashMe, but the same game failed to boot. After this I booted up a DoFAT image and to my surprise there was no loading time, made it to a save point and then restarted the NDS and saved the SRAM to another slot. I then tried booting the game using FlashMe and it worked like a charm! I'm happy to report that the G6 is the first development unit to feature a FlashMe fix! Next I thought I would fool around and remove the original Nintendo DS cart and try to boot the DoFAT image and to my surprise you do not need any cart in the Nintendo DS to boot DoFAT images other then the G6 itself! Now I reloaded the first GST image and was presented with the option to load the SRAM I had saved along with the SRAM and BLANK slots. The same thing happened when I loaded the DoFAT image and both worked great as I could resume my game play. After I was done I saved the SRAM onto the PC, deleted it from the G6, restored it, booted both images again and could continue from where I saved. So the SRAM manager works flawlessly! 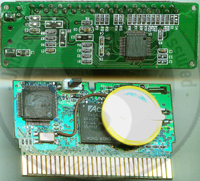 I'd also like to add that it did not matter what type of game I had in the slot when booting as the SRAM is saved directly into the EEPROM in the G6 and not the original NDS game. The second thing I tested was the Game mode and loaded MoonShell, but unfortunately it could not read directly from the G6 file system itself so if you want to add your own MP3 you must manually compile MoonShell and then copy it over to the G6. So I downloaded the latest build on the MoonShell media player, compiled it with a bunch of MP3's and then copied it over to the G6. MoonShell played them flawlessly, including an MP3 that was two hours long! All of the demos, homebrew and emulators I put on the G6 worked like a charm and it was nice to see some good old Super NES in action! I tested NESDS and SNESDS with no problems with either of the two. Now it came time to test the GBA functionality. I simply booted the NDS and pressed START. A menu comes up with some options: My Card, Game, Media Player and PDA. The My Card option simply will let you browse the G6's file system, but is useless if you try to execute anything. One thing I did notice is that both screens, no matter what screen you set the NDS to display the GBA output on, stay lighted up. This will result in less playtime due to excessive battery usage. 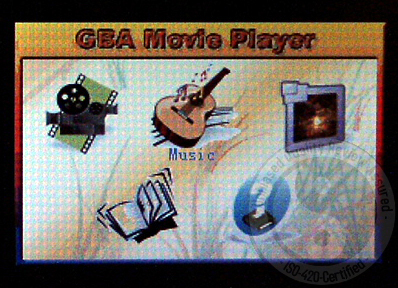 The Game menu was a nice addition to the G6's software as I was presented with a splash screen (you can change it using the U-Disk manager) and then a selection of the images displayed using a screenshot from the game along with its internal game name (which would be a nice addition for the NDS loader in future edition). When I went to boot a game I was asked which SRAM slot to use and then if I didn't pre-patch the image with the RTS option using the U-DISK manager was asked if I wanted to use the RTS patch. Unfortunately out of the six games I tested half of them crashed when I applied the RTS patch. If the patch did work I could press A+B+L+R to bring up an in-game save manager menu where I could save and restore save states. The next option I played around with was the Media Player, which is the well known software from the Movie Advance Player which G6 claims to have produced. The Pubic Relations Representative from G6/M3 told me if you find this software on any other GBA/NDS device that it has been copied without permission, but at the time of this review I was unable to verify his claims. If it is their own code that could explain why the ability to run PocketNES from it has been removed and the application imbedded into their BIOS, but who knows for sure. The options that have been untouched are the Movie, Music, Picture and Book viewing. Using the Media Conversion Software on the PC I converted various media files and then played them back. Even at high quality there was no lag which is due to the fact that the files are being read from the high-speed G6 memory chips and not from slower CF/SD cards. Moreover, the EBOOK reader still has it's built in menu along with bookmarks which has been cut out from competitors flashcarts. After this I tried out Goomba, Dr.SMS, PCEAdvance and the Pocket NES emulators and they all worked fine. Lastly I booted up the PDA applications, but in GBA mode they are about useless as you have to navigate using the keypad. As of the date of this review the other PDA applications advertised on G6's homepage such as the phone book, dictionary and notepad. 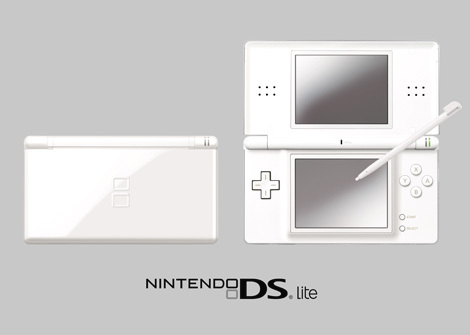 Personally I would have loved to have a notepad that used the NDS stylus. Not only was I a beta tester, but a lot of my ideas to make the product easier to operate by the end user were actually incorporated into the product itself. I was pretty amazed that my ideas were implemented into the final product and even though I didn't ask nor wanted to be compensated for my efforts I feel a sense of pride knowing that I had a hand in the creation of this product. Due to the simplicity of the software, firmware and game conversion I would say this is the best development/backup solution I have used for the Nintendo DS to date. If you'd like a booting solution that doesn't hang out of your console and features quick loading times I would suggest this unit, but if you're looking for a device with removable high capacity media I would suggest buying the G6's counterpart the M3.